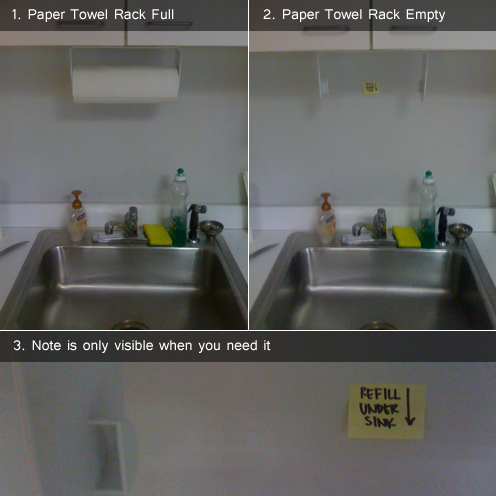 Here’s a great example of great usability in real life at the Roundarch office. It’s a very simple yet elegant solution to an annoying problem. What happens when you run out of paper towels at the office? Do most employees know where they are stored? People rummage through different drawers to find more. This little PostIt note provides contextual relevancy. It’s visible when you need more paper towels and it tells you exactly where to get it. When the towel rack has paper, you can’t see it so you don’t develop “blindness” towards the message. Hats off to the person who came up with this.